Caption: The Lady Mayoress Edna Murray and the Lord Mayor of Leeds Councillor Thomas Murray with Trude Silman, who has dedicated many years of her life to volunteering. 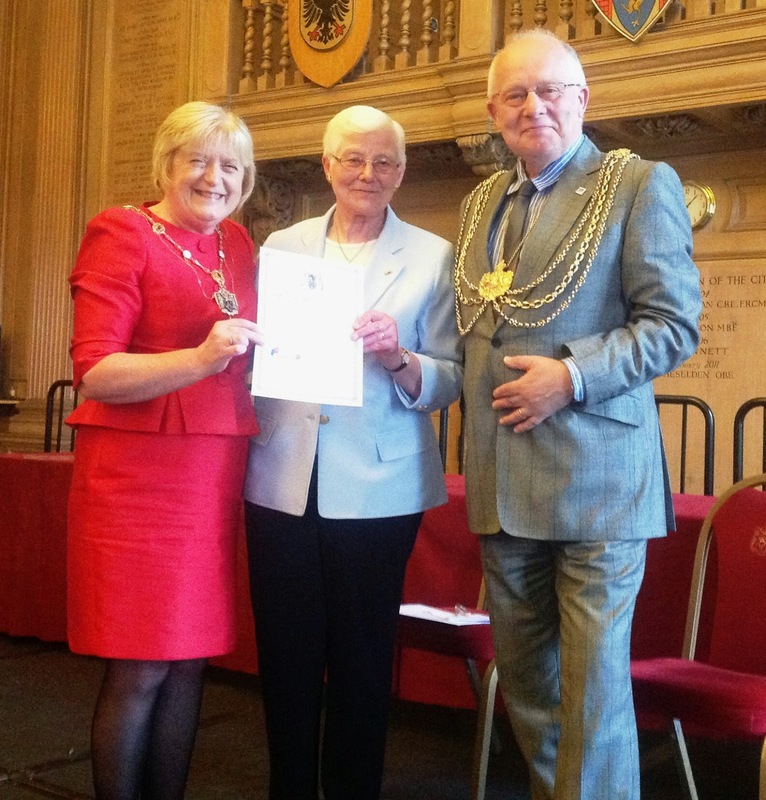 The selfless work of volunteers has been recognised as part of a special event held at Leeds Civic Hall. Hosted by the Lord Mayor of Leeds Councillor Thomas Murray, volunteers from across the city were invited to attend the civic hall as part of an occasion which celebrated their outstanding dedication and commitment to helping others. Included on the night was a speech by Natasha Mort from Voluntary Action Leeds, who talked passionately of the tremendous difference volunteering can make in communities and the economic value of volunteering to the city each year, which is approximately £38.5 million. Six current volunteers also shared their motivation and experiences at the event. The youngest speaker was 18-year-old Rebecca Goff who has been encouraging younger children to read more books with Leeds City Council’s libraries service since she was 14. At the other end of the scale was Trude Silman, who is now over 90-years-old. She has been volunteering for most of her life. Trude explained that her commitment to ‘put something back and do something for others’ was shaped by her experience as a nine-year-old refugee of Germany during the Nazi era where she was so overwhelmed by the kindness of the many families who took her in. Others who shared their story included; Sam Leigh of the Nigerian Community Association Leeds, Charlotte Bone of the Department of Health, Amrit Choda of the Ahead Partnership and Marvina Babs-Apata of Angel of Youth. In a real highlight, long-standing volunteers with 30 years of service, Rosalind Bickler, Jane Brown, Paul Box, Trude Silman, Marian Padbury, Breege Walsh, Malcolm Padbury and Trude were also presented with certificates and thanked for their service by the Lord Mayor. After the awards were presented, a young poet, Sukbir Kaur who is involved with the Angel Of Youth project, brought the event to a close with a performance piece about’ volunteering and giving’. Recognition of volunteers and their hard work forms part of National Volunteer week held this year from June 1 to June 7. "There can be no doubt that the contribution that volunteers make to the city is priceless-they are absolute diamonds. "Volunteers are very much the unsung heroes of our city, who in seeking no reward or fame, have an outstanding commitment to helping others. "It was brilliant therefore that in a small way, we were able to celebrate and thank many of our volunteers for their hard work as part of this event at Leeds Civic Hall. "It was an absolute honour for me to also meet a number of long standing volunteers and show our gratitude for their 30 years of service. Some of their personal stories were amazing, and they continue to be fantastic role models for a new generation of people starting out in volunteering work." Volunteers’ Week is an annual event which takes place on 1-7 June. It celebrates the contribution made by millions of volunteers across the UK. It’s run by NCVO in partnership with Volunteer Development Scotland, Volunteer Now (Northern Ireland) and Wales Council for Voluntary Action. Visit www.volunteersweek.org for more information.